Francesco Vitale at Nauta Yachts calls to say he's just taken over the central listing for the impressive 49.9m motor yacht Dakota. Built in 2000 by Codecasa to Lloyds and RINA class, Dakota has extensive accommodation for 12 guests in six cabins including a master suite and twin cabin on the main deck. A further two double and two twin cabins are below deck, all equipped with the latest audio-visual equipment and satellite television. Dakota’s twin 2231hp Caterpillar engines power her to a cruising speed of 17 knots and a range of 4,600 nautical miles and she has always been a private yacht, never subject to the rigours of charter. 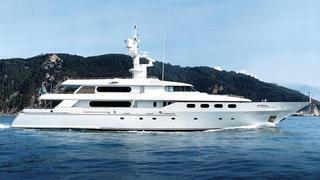 Lying at Olbia in Sardinia, her asking price is €11.4 million, VAT paid.